Gift Shop - Farmers and Hunters Feeding the Hungry - Hunt Down Hunger! Gift Shop - Support Our Mission! Check out these great gift ideas for hunters! 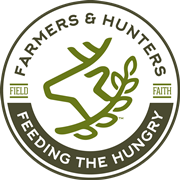 Your purchase supports our mission to help hunters and farmers donate nutritious meat to feed the hungry. If you encounter any problems, have questions about any of the items, or prefer to order by check or money order please call 301-739-3000 or email us.